I'm in the process of restoring a 1966 Mustang convertible. I'm going back with the original exterior color, Nightmist Blue. It appears that I have two different colors of blue on the interior. A medium dark blue on the molding between the dash pad and the windshield and more of a silver blue on the remainder of the interior metal. They don't come close to any of the paint chips I have been able to find on the web for 1966 Ford products. Do you, per chance, have the paint codes on the interior blue paint? Was the original interior paint all the same color or was it two colors? I'm going to break this down in a couple of ways, so you can hopefully patch together, what exactly the 1966 Mustang interior paint codes you need to get back to the original interior color. You'll see, in the above 1966 Mustang Paint Code colors (the blue ones), that there were five possible blue choices for Ford blue car interiors (at least according to Ditzler). so it's understandable if someone got it wrong. My list of Interior trim and code numbers doesn't say anything about two tone blue appointments. Interior color choices came in several possibilities, depending on the decor group and type of seats installed. Typically, there were two standard choices and one optional finish depending on the seat/interior combination (ie standard, pony). In the case of the rare bench seat option, there was one standard color and two optional choices. Here's how the 1966 Mustang convertible interior paint codes break down in that exterior color choice. What I usually suggest now, to zoom in on the correct color, is to either take the car down to the paint store, or find some piece of the car that appears to have the original color intact and get it to them for matching. If paint chips don't work, many places now have a kind of digital paint analyzer, which basically takes a picture of the paint and then matches it up to the correct paint replacement color. 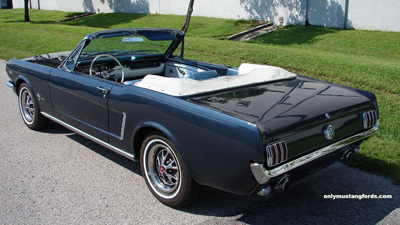 You may also want to check out the pictures on the 1966 Mustang page. You'll notice in the interior pictures, a car with a blue interior. If you look at the difference between the door panels and paint, or dash and dash paint colors, it may seem to be two toned. But it's simply the difference in colors between the interior panels and dash and the hard painted surfaces. Thank You for your site, but I still am somewhat confused. shown your list of colors. Outside color is Silver Blue Poly. now need paint. What is "Code 22" and where can it be found. I cant rely on any colors used previously as I want original colors and I don't want to just repeat any of the prior mistake. The Code 22 isn't a color but the interior code for the upholstery. It says that the interior vinyl coverings and trim are a combination of light blue and medium blue vinyl. What I would suggest, is going to your local automotive paint supplier with a small piece containing the paint on some removable part of your interior and matching it/comparing it to their Ditzler 1966 Ford interior colors page (index 2). There are not that many blue color options for the entire Ford line for 66, so it should be fairly easy to match it all up successfully.